Now that 2014 is through, it's time to kickstart a new year with plenty of resolutions and new ideas of what 12 more months can bring. It also means it's time to look back at the previous year and analyze what worked and what didn't, who won and who lost. Last year was tough on the industry in some ways, while in many other respects, it was great. Streaming took charge, while digital sales began to really slide. Vinyl surprised everyone, while brick and mortar stores took a beating. There are plenty of ways to spin the numbers, so sometimes it's best to actually just look at them for the data points as they are. Here's a quick look at how the industry fared in 2014 by the numbers. Unsurprisingly, streaming music saw the greatest gains of any sector of the market, and it wasn't even close. In fact, 2014 appears to be the year in which there was a shift, and now the majority of people opt for streaming songs and albums online as opposed to buying them. In 2014, Americans streamed an incredible 164 billion songs. Yes, that's billion with a "b." That number is up from 106 billion the year before, which shows massive growth. The number of albums streamed (or streaming equivalent albums, which are the total tracks calculated as if they were albums) more than doubled from 53 million in 2013 to 109.3 million in 2014. Those billions of songs sound great, but they might make more sense when put into an album-style figure. As streaming services are now the primary way that Americans listen to music, Billboard had to change its charting methodology to include it, accepting that the old sales-first model wasn't accurately representing what was most popular in the country. Once the charts take the new technology into account (something they don't do lightly), you know things are serious. While digital is still performing better than physical sales-wise, things have been on the downward slide for a few years now. In fact, 2013 was the first year that saw a decline in the number of digital products purchased, and 2014 saw that dip increase quite a bit. 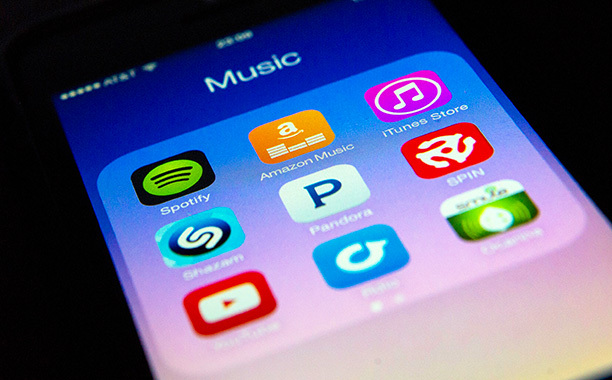 The sale of digital songs declined over 12 percent, down to 1.1 billion. That figure is over a hundred million fewer than the previous year as well. Thankfully, the number is still above one billion, though we'll likely see the number of digital tracks sold fall under that benchmark in the next year or so. Digital albums fared a bit better, losing less than 10 percent. In 2014, Americans purchased 106.5 million full albums, which was closer to 118 million in 2013. According to the numbers, people are buying fewer and fewer new albums, but older releases (called catalog albums) don't seem to be hurting as much. The sale of actual CDs has been hurting for some time, and the pain continued last year. Physical albums are still selling better than digital ones – 140.9 million versus 106.5 million, respectively – but that's still down from the previous years' 165.4 million. Those buying CDs have chosen to go online for them or to get them in places other than stores. Amazon, Starbucks, and merch booths at live shows seem to be the winners here, selling over 38 million albums combined. That figure actually shows growth, as the year prior it was just under 37 million. It isn't a lot of growth, but the music industry will take it anywhere it can get it. Big stores such as Best Buy, Barnes & Noble, and "mass merchants" like Target and Walmart all lost ground, with the large chains selling just over 31 million albums collectively, which shows a loss of over 20 percent year over year. Target and Walmart are right behind them, selling double the number of albums, but with the percentage lost almost equal. Some good news: independent stores sold a million more albums than they did last year, which is a growth of less than one percent (but hey, it's better than a loss). Percentage-wise, vinyl was really the big winner this year, as sales grew more than 50 percent, which marks the greatest gain for the format since 1991. While that may sound like a huge jump – and it is for vinyl – the number of wax records sold is still under 10 million, which marks less than six percent of all albums sold. No worries – vinyl may rise again next year, as has been happening recently. In fact, this is the fourth consecutive year where the total number of records sold hit an all-time high. Hopefully 2015 will set a new record (pun intended).